Low Cost 3 DOF Flight Simulator Motion Platform Software. Click for info on using Dyadic SCN5 Actuators. UPDATE Sept 2014: A beta driver version for the racing car sim rFactor is now available - See the online guide for download and details. The Motion Drive Software is a key part of any motion platform system. It handles the real-time extraction of flight data from the flight simulator and the calculation of motion cues for the platform for export to the Signal Processor Unit or other external control hardware. 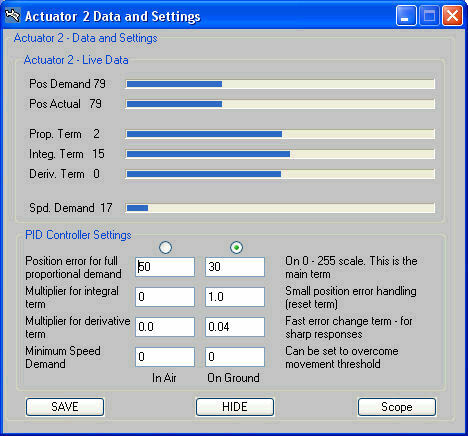 The primary output of the motion software is position demand cues for the platform. These position demand cues are then used as inputs to position-feedback (servo) control software/hardware to drive the platform movements. 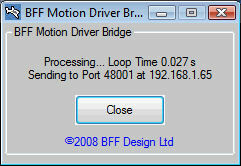 BFF PID Servo Control software is included which can be used with control system hardware available on the site to implement a DIY closed loop servo control system. V2 of the motion drive software for MS FS9/X/Lockheed Martin� Prepar3D�, X-Plane, Condor and Falcon F4-AF is available and includes a number of additional features including direct cue output to Galil motion controllers, an articulated projector motion drive output, LAN operation, manual override for platform setup, virtual oscilloscope and several others. The full software package includes the BFF Motion Driver, BFF PID Servo Controller, configuration set up programs for uncoupled DOF and 3-point support type platforms and the BFF Bridge application for use over your LAN. Versions for FS9/FSX/Lockheed Martin� Prepar3D�, X-Plane 8.6 to 10.0, Falcon F4 and Condor Soaring. Plus beta version for rFactor. Motion Cue outputs for 2 and 3 DOF platforms with independent DOF actuation and for 3 point support platforms. V2 includes the Articulated Projector Drive for added motion immersion in DIY set ups. Alternative data output modes - Binary, HEX2 for general use and Shared Memory or use with the 64SPU-1 SPU and for direct inter-process data transfer to other applications. Direct output to Dyadic SCN5 actuators. Direct output to Galil motion controllers with Position Tracking motion modes - see User Manual). V2.80 (selected versions) adds direct output to Dimension Engineering Kangaroo control modules. Included PID Servo Drive Control software for DIY electric motor drive control. Highly configurable cue settings with separate set-up programs and multiple file saves. In-program cue settings for faster cue tuning. 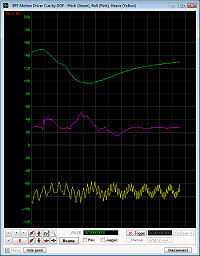 Built-in Virtual Oscilloscope for live motion cue tracing. 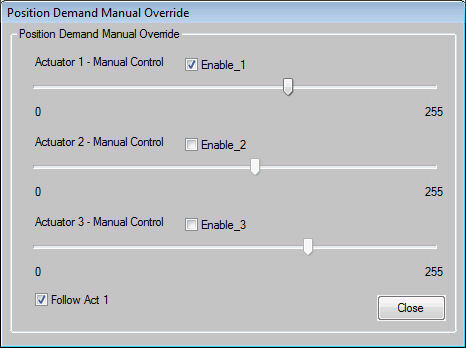 Manual Override of position demand outputs for platform set up activities. Live Capture of aircraft accelerations and angles to assist with cue configuration activities. Cue data text output for charting & inspection. Selected aircraft status indicator outputs in HEX2 output mode. Support for US Digital MA3 position encoders and for 12bit potentiometer position feedback. Motor Speed Controller real-time condition monitoring (when used with the 64SPU-1 SPU and MD03 motor controllers). Hot key and hot button feature for drive engage/disengage. The motion drive software for MS FS9/FSX/Lockheed Martin� Prepar3D� uses Pete Dowson's FSUIPC to obtain motion data from the flight sim and gives data update rates of about 25/33 sets per second (system dependent). With v2.6 this can be adjusted upwards and is limited by FSX frame rates and your PC performance. The X-Plane and Condor versions utilize the sims' built-in data output facilities and communicates with the simulator using UDP protocols and like the V2 MSFS version can be run on the same machine as the sim or over a network. In-program cue settings for easier system tuning. Built-in virtual oscilloscope for live cue tracing. Data "Capture" feature to quantify flight accelerations and angles during important motion events. The V2 drivers come with PID Servo Controller software which performs control loop servo calculations on the PC that were previously done by the external control hardware. This substantially simplifies the external hardware and offers better control algorithms - see the Signal Processor Unit design here. The PID controller only works with the SPU hardware described on this site - for your own hardware use the direct position demand output from the Motion Driver. The movement cues are derived from aircraft accelerations and orientation. I've used classical filtering and washout algorithms (cf this Masters Thesis) to develop force cues. Platform pitch angle is derived from the instantaneous aircraft fore/aft acceleration and pitch angle with an element of pitch-rate cuing. Roll angle is derived from sideways acceleration with an element of roll angle to simulate felt roll rates. There is therefore a strong element of "gravity alignment" or "tilt coordination" in the pitch and roll DOF's to simulate the force effects of acceleration and orientation, although the strengths of the effects can be user adjusted. The heave cue is the most complex and is derived from aircraft heave acceleration. The limited cockpit heave movement makes heave motion cueing less than straightforward. Cueing sustained acceleration events isn't possible with a short stroke length so only the on-set and off-set of these events can really be cued and making these short acceleration "impulses" feel right with the simulator visuals and control events is quite challenging. This is done by noise filtering, limiting and washing-out the aircraft acceleration to catch only the start and end of sustained acceleration events. The heave motion is further complicated by the general behaviour of the type of aircraft being simulated. For example light GA type aircraft flown in a controlled way don't see levels of acceleration that are all that high - indeed any flight turbulence there may be can quite easily swamp the manoeuvring G's. So an effective use of the heave movement in the motion cockpit seems to be to simulate ongoing heave activity due to flight turbulence and also to simulate what can be quite active movements during the higher speed runway operations. There is a detailed User Manual which describes the program setup and use - see the user manual. From this you can see that many of the parameters used to control the motion cues are adjustable by the user. Another issue related to heave motion cueing is that quite often FS9/X reports flat-calm flying conditions and unrealistic zero heave movement even in light aircraft which you might expect to bob about quite a bit. Similarly on smooth runway types there is very little heave movement reported even though take off and landing runway activity should be quite dynamic. To make these events more realistic I've built-in a heave motion recording facility which allows you to record a 2 minute long spell of heave activity from FS9/X for the aircraft normally used. This can be used to record straight and level flight motion with no effects present other than light or medium turbulence effects and can later be switched on or off in flight to suit personal preference when the actual flight conditions seem too flat. 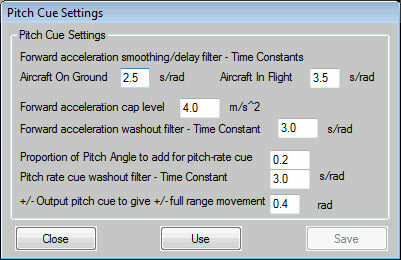 Dynamic runway effects can also be added by the motion driver - for details see the User Manual. The need for these added effects in X-Plane is less pressing as its flight model produces much more movement during normal flight. Copyright � 2006-2014 BFF Design Ltd All Rights Reserved.